Yes, hard to believe as it seems, BigDandMe is three years old today, 109 posts and going strong. I started the blog on Easter Monday, 2009. In some ways it seems longer, especially just before writing each post. But I have enjoyed writing it immensely and I have gained great pleasure from the help it has given other members and the discussion it has triggered. A while ago, Robert from Montreal wrote. He had some really useful information to share about the benefits of varying the amount of fluid removed during a run. Called Profiling, it’s something I have not written about, and Robert’s email is a great way to do that (thanks R0bert!). I want to express my gratitude for your cogent essays. Since I discovered your blog several months ago, I have learned more about dialysis in its multidimensional aspects than I I’m sure I actually wanted to know but such is life in the BigD world. Today’s offering inspires me to finally drop you a line & tell you a short tale, the agent for which is your comment about the 4th hour blues. I am on Hemo & have been for about 18 months. I go MWF – 3 x /wk for 4 hrs [+] & found that somewhere in the middle of the 3rd hours things would get pretty tough on my body in so many ways & by the end of the 4th I would be extremely weakened. Of course a lot of this has to do with various set-ups & mainly fluid removal – size that is & since I am on the heavy side, needing to remove 4 -5 K after a 3-day weekend would not be unusual – much less during weekday sessions unless I’m playing catch-up – all of this dependant on the season – the summer heat is kind to me – the winter cold & I balloon – & then there’s the hangover & the destruction of a happy normal sleep pattern. BUT happenstance & a bit of experimentation caused us to discover that my tolerance during the first hour of Hemo was really great & that I can remove 2 K without apparent stress, so months ago we changed my routine to 2K the first hour followed by say 1.5K for the following 3 hours or whatever my goal might be. Further the Dialysis machine is programmed to a declining profile which maximizes the fluid removal in a diminishing scale to the end of the session. So the heavy work is done up front in the first hour, medium during the second, lighter in the third & lightest in the fourth. I seem to slide into home base more easily – almost recovering during the last bits & although my body still hollers later on, it isn’t as bad – recovery seems to come more easily & I leave the sessions solidly on my feet. Now, you may have already tried something like this or know of it or something about it or may find my method useful for yourself or others who have a hard time in those tough late hours or who knows, may object to it. . . . And another observation if you don’t mind – with dialysis removing all the water soluble electrolytes that our ticker needs to keep boogying, why is it that “they” don’t give us some sort of tonic near the end of our sessions to replace these important molecules – the B’s & D’s &? – seems like I go home have a civil dinner, crash in front of the TV for a couple of hours & wake up hungry like a bear – It’s all I can do to stop myself from feeding until I feel better. If any of this makes sense to you, let me know. In the meantime, again thanks for your studious approach, well written – as good as any good mystery or travel reportage. Profiling is a well proven technique to help minimise the impact of fast fluid loss. Some people don’t need it (especially if the fluid to be removed is less that say.9k per hour), though not always. Kinds of profile vary too. Some people, like Robert, can handle big-time amounts removed early in the run and then taper off. Others (often diabetics) need the exact reverse: a slow build-up, with small amounts removed during the first hour, and ever increasing amounts taken of as their body adapts. Just because it’s our anniversary I’ve decided to illustrate the point with some homemade graphics (made with PenUltimate on Julie’s iPad). The Y-axis is fluid volume, the X-axis it time. There are three profiles shown. The green line shows volume vs time unchanging (no profile at all really). The red line shows Robert’s profile, with more taken off early and less later. 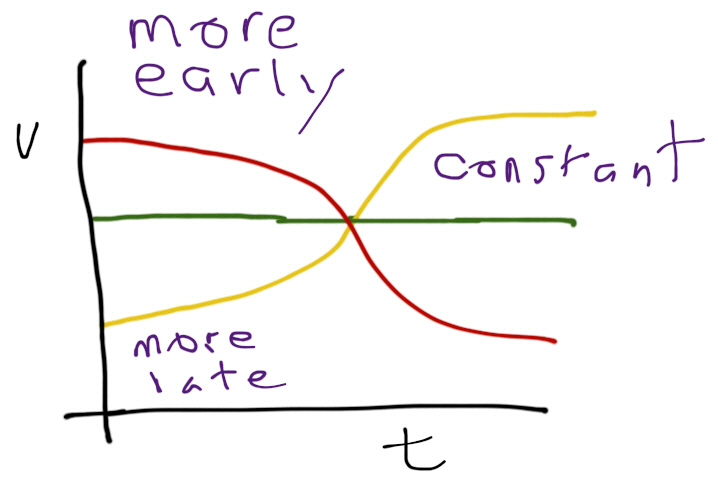 The yellow line shows the reverse profile, with less taken off early and more later. 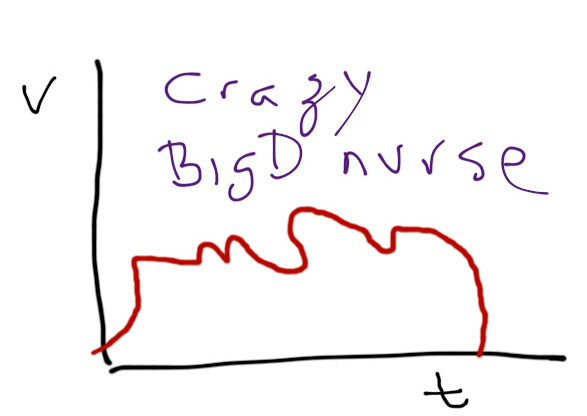 Just for fun I also included the profile of a crazy dialysis technician/nurse, because I could. Profiling is pretty standard, and available pretty well everywhere. Most dialysis machines can be programmed to whatever profile works best for you. As Robert said, it takes a little experimentation and common sense, but if you have the kind of symptoms Robert wrote about, maybe it’s worth a try. Posted on April 9, 2012 by dialyblog •	This entry was posted in Healthy dialysis. Bookmark the permalink.